CUBA STANDARD — Bringing the number of large-scale solar parks on the island to 14, Cuba is building seven photovoltaic parks this year, official daily Granma reported. The seven new parks will add 8.15 megawatts to the island’s growing renewable-energy portfolio. Cuba is planning to increase the share of renewable energy from 4% today — most of it from sugarcane bagasse — to 10% in 2020. 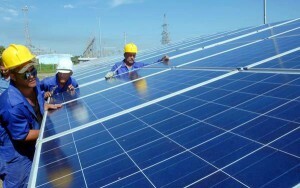 Sixty percent of the contract volume for the solar arrays installed in 2013 went to Cuban companies, said Aleisly Valdés Viera, director of renewable energy sources at state utility Unión Eléctrica (UNE). The solar parks built last year apparently use Chinese-designed panels that are assembled at a state company in Pinar del Río province. Official sources only provide project volumes in Cuban pesos, which underrepresents the true cost. The solar parks built in 2013 using Chinese technology are located at Havana, Santa Clara, Guáimaro, Santiago de Cuba, Guan­tánamo, Isle of Youth and Cienfuegos, in rural areas close to urban centers. The largest solar array built last year — Cantarrana near Cienfuegos — consists of 14,100 solar panels generating 2.6 mw on 4.72 hectares. The highest-profile array, consisting of 4,300 solar panels, began operating at the Expocuba fairgrounds near Havana in November, providing 80% of the facility’s electricity needs. The Chinese government provided $1.5 million for the Expocuba solar park. In addition to the solar parks that feed into the national grid, Cubasolar, the government agency in charge of solar energy, has installed solar arrays in 410 schools, 165 public TV rooms, 20 social clubs, and 500 residences in rural off-grid areas.